I started the background with glimmer mists in Sunflower and Denim Blue (Tattered Angels) and Gelato in pink and gold (Faber-Castell). Then I applied purple and denim blue distress ink (Ranger) over round patterned stencils (TCW). I also trace the chicken wire with a stencil (TCW) and a pink pen (Faber-Castell). 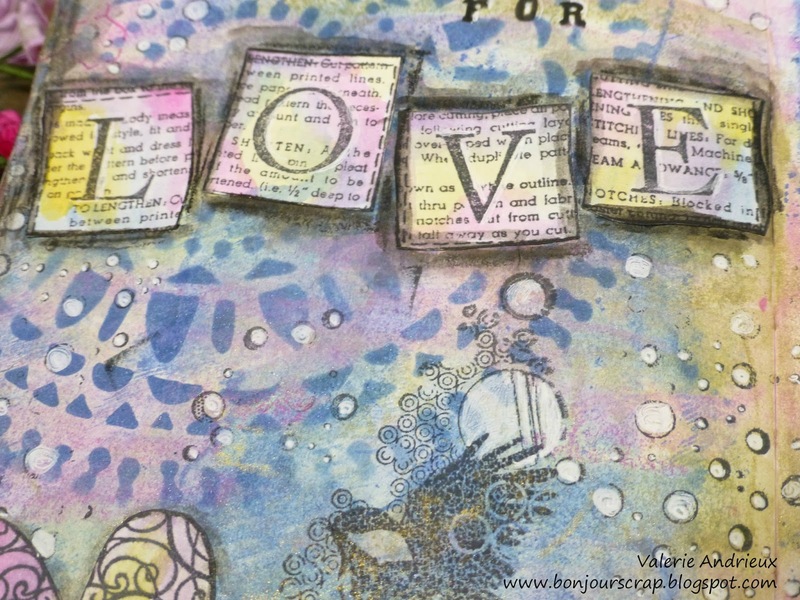 Then I stamped the love blocks (Inkadinkado) and the hearts (Prima Marketing) in white paper, print the phrases and painted then with the same distress inks and a watercolor brush. I stamped the bubbles (Deep Reed), the title, and the birds (Inkadinkado) directly on the pages. I added some white with a gel pen on the bubbles. When the stamped white designs were dry, I glued them on the pages and added black gelato (Faber-Castell) around them, smearing it with finger and water. Wish me good luck for this challenge, and see you soon for another project ! WOW…truly an awesome art journal page…I love the birds used…the lettering is fantastic and so is the gorgeous background...Thank you so much for joining us at More than Words !! I did add it in my blog, thank you Di for pointing that out ! Oh I LOVE your recipe! 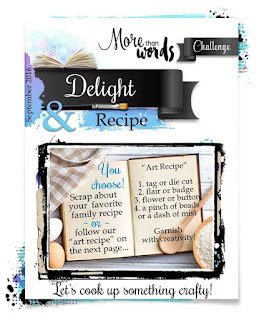 What a clever take on the recipe challenge! So thanks much for joining us at More Than Words. Fantastic!!! Thank you for playing with us at morethanwords challenge. What a nice word to read... Thank you Valerie ! Wow! I am so very impressed! 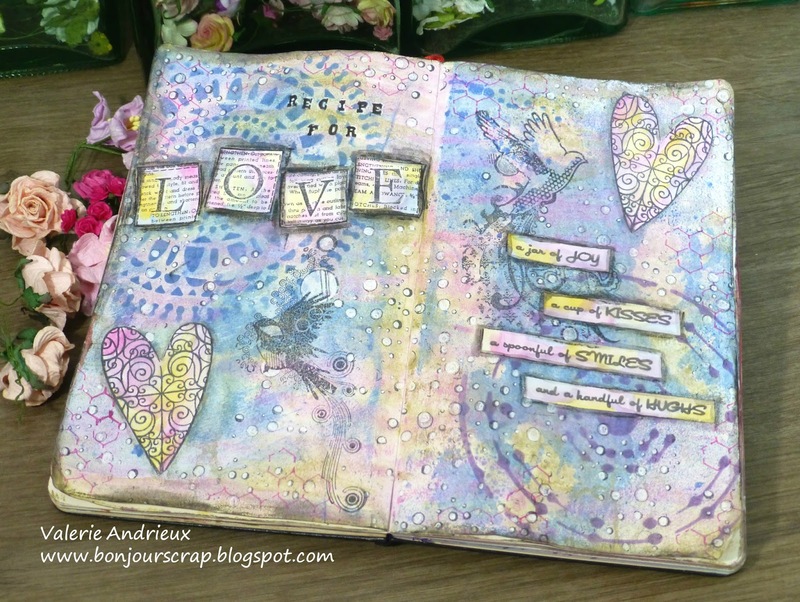 Fabulous background and journaling work. Thank you for sharing your art with us this month at More Than Words. It is my pleasure to share my work with you all ! Thanks Joyce ! Thanks for your kind word ! I'm not usually pastel but love the result too ! Thank you ! And what a fine recipe it is! Love it! Thank you for playing along with us at More Than Words!